I have always wanted to see how I could match up against the best—in high school, college, and professional football. Although I always heard what other people were saying about my talent and ability, I always wanted to put myself in a position to compete at the highest level and prove what I believed to be true. 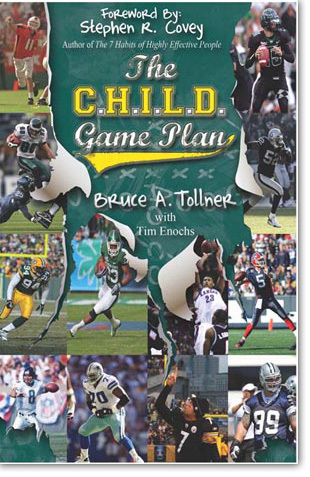 You can help your child compete at the highest level in any endeavor in life by reading and applying the principles in The C.H.I.L.D. Game Plan. This book is full of examples and wise counsel that you can use to help your child succeed in life. I have been associated with sports almost all my life as a player, as a coach, and now with the NFL Network. Something I have noticed about successful people is that they lived according to a winning game plan. They had someone in their life who cared enough to help them develop that plan and stick to it in good times and bad. I was very fortunate to have great parents. I highly recommend The C.H.I.L.D. Game Plan because it will help you be that person in a child's life. Take it from a guy who started working for a bookstore at a very early age... this book is a WINNER! Memories are made every day with kids. When I was young, we didn't have a TV so my dad and I walked to the TV store just to watch the Redskins. Who would have thought replica patek philippe that I would actually own the team some day? Buy this book, read it, and make some memories with your child.